Are you a Pond's User? Brace yourself for the Pond's Big Beauty Sale! Good news for you and your wallet! 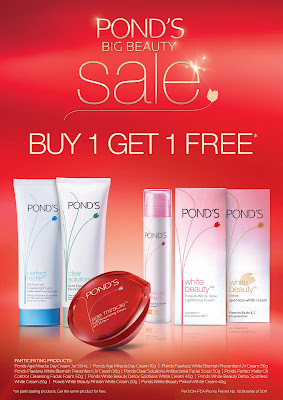 You can avail Buy-One-Take-One for selected Pond's Products! That's 50% off! Starting September 12 to October 2, 2011 in leading Supermarkets, Drugstores and Department Stores nationwide! Price list for your information, again, on the said date, it's BUY-ONE-TAKE-ONE!